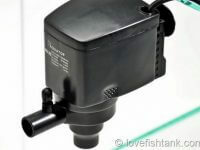 In most types of filters for Koi ponds today, pressure bio filters are the best ones to choose. 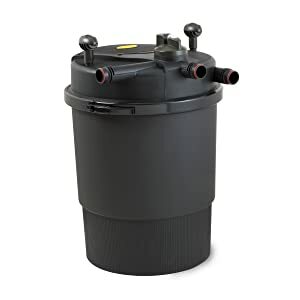 This type of pond filters features a very capacity larger than the rest making the best choice for dealing with a huge amount of waste from pond fish. 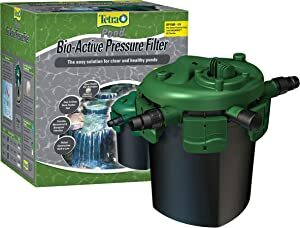 Moreover, a good pressure bio filter can help to better control the biological balance of your pond system, keeping your fish happy and healthy. This article will highlight some of the best pressurized bio filters that you should use with your koi pond to ensure it stays clean and the fish are in a comfortable environment. How to choose a koi pond filter? Koi pond filters do two kinds of filtration: mechanical and biological. Both are vital for the health of your koi. Koi produce a fair bit of solid waste, and it needs to be filtered out of the water so that it doesn’t poison your koi. Your koi pond filter system can use various types of filter media for mechanical filtration such as foams, coarse, or plastic media. 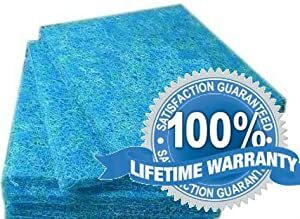 Probably the best materials for mechanical filtration are Japanese filter mat and coarse, which allow the water to flow freely, and don’t clog. Most mechanical filter media also provide good biological filtration. You can also use a water vortex that separates out particles by centrifugal force. 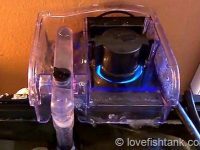 The vortex is the only kind of mechanical koi pond filter that doesn’t need regular cleaning, and it’s also probably the most efficient. One good approach for your filter system is to have a vortex filter followed by a chamber with brush filter. You can add more kinds of filter if you have space, time and money – better too much than too little. More about koi pond filter media below. The biological filtration use friendly bacteria to process the ammonia which koi produce in their waste. The bacteria turn the ammonia into nitrite and then nitrate (See more: Nitrogen cycle in a fish tank), and that can be kept in check with your usual weekly koi pond maintenance. For biological filtration, you’ll need chambers which contain some suitable material for the bacteria to live on. Ceramic rings, bio-balls and bio-balls offer great biological filtration, as they provide a huge surface area for the bacteria to live on. After you build your pond, it will take a month or two for the bacteria in your filter to multiply to the right levels, so until that’s happened, it’s best not to introduce too many koi, or feed them too much. In fact, it’s a good idea to increase the number of koi in your pond gradually, a few at a time, to give the filter time to adjust. If you want to speed the Nitrogen cycle process up, you can get dried bacteria culture which you can add to your filter. 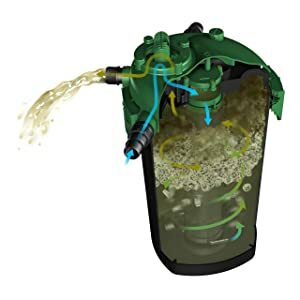 Biological filtration will also help stop algae growing in your koi pond, so you may find that after the pond is built, the pond goes quite green, but this should improve once the bacteria are established in your koi pond filter. You may also get an algae bloom in winter because bacteria will be more active in summer than in winter, but don’t be tempted to treat it chemically, as this will damage the bacteria in your filter. There are basically two kinds of koi pond filter system: pump-fed filter systems and gravity-fed filter systems. A pump-fed filter system has a pump submerged in the pond, which pumps water from the pond into the filter. The filter sits above the ground. The clean water pours from the filter back into the pond. A gravity-fed filter system works by gravity rather than pumping. 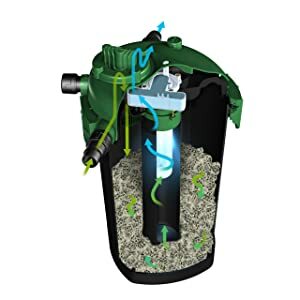 In this case you have drains at the bottom of your pond, and gravity pushes the debris down through the drain, along pipes, and into the filter. In this case the filter needs to be buried so its top is level with the ground. That’s because gravity will ensure that the level of the water in the filter is the same as the level of the water in the pond, so if one is higher than the other, you’ll get overflow. Gravity-fed filter systems also need a valve so you can close the system off from the pond for cleaning. These filters are fed with water pumps that help to remove water from the pond to clean it and then send it back into the pond once it is cleaned. They offer both biological and mechanical filtration. This type of pond filters provides the simplest and affordable way to keep your pond clean and clear. 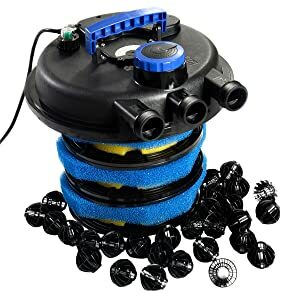 The pressure filter usually features a backwash feature that helps to remove sludge and debris out of its filtration system much more easier without the need of opening its lid and getting out the filter materials for manually cleaning. This helpful feature makes these filters loved and chosen by many hobbyists. Old style filter systems work by passing the water through filter media which sieve out the debris. Vortex filters work quite differently. They spin the water, and the centrifugal force sends all the waste in the water to the sides, where they hit the walls and drop down to the bottom of the chamber. The waste can then be removed just by opening a valve at the bottom. Vortex filters are probably the most effective filter available – they can remove over 75% of the waste that passes through them. They make a great first chamber in a multi-chamber filter system. These are marvellous things which dramatically improve water clarity and color by removing proteins and very fine solid waste from the water. 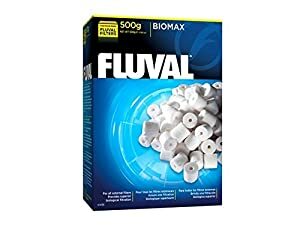 They’re especially useful if you have a problem with foam on the top of your pond, as this is caused by proteins and other dissolved compounds. Basically they work by frothing up the water inside the skimmer; the proteins etc stick to the bubbles, and this foam is passed to the waste out pipe. The remaining water is returned to the pond, much cleaner and clearer than it started. As an added benefit, all the foaming raises the oxygen level of the water. Trickle filters, also called trickle towers, are a very effective kind of biological filtration. They work by pumping water to the top of the tower, then spraying it over the filter media. The water trickles down through the media, and back into the pond. The reason they’re so effective is that the bacteria on the filter media are not underwater, they just have water pouring over them – this means they have more oxygen, which means they process much more ammonia, and can even turn nitrates into nitrogen gas. A good koi pond filter is the most important investment for your koi pond. 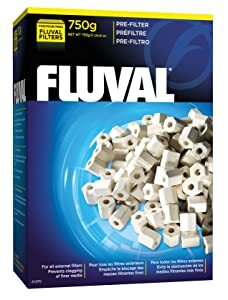 Don’t waste your time with those little box filters you see in garden centers! Koi are very sensitive to water quality, and it’s vital to have really good specialist koi pond filtration. That means a purpose-built koi pond filter, consisting of several chambers, doing different kinds of filtration. A good koi pond filter usually has more than one kind of filter media. 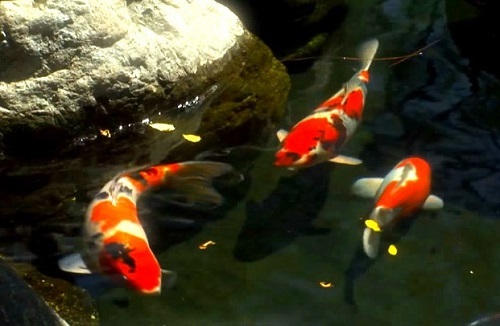 Whatever approach you’re taking, when choosing your koi pond filter, you’re going to need to think about the size of your pond, and the number of fish you plan to have. 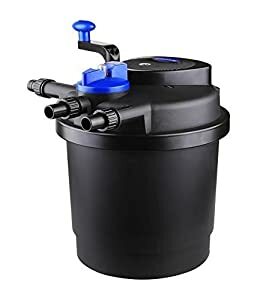 You need to be able to pass the entire volume of your pond through the filter once every two or three hours, so the larger the pond, the bigger a filter you need. And the more koi you have, the more waste they produce, and again, the bigger a filter you need. Commercial filters will tell you what size pond and how many koi they’re designed for. If in doubt, get something bigger than you think you need, rather than risk getting a filter which is too small. Think also about how much time you have. Some koi pond filters require more maintenance than others. So if you’re short on time, go for something which is easier to look after, such as a pressure filter. This will be more expensive, but will take up less of your time. They do need backwashing occasionally, but this will only take a few minutes, and isn’t a messy job, just a question of turning a lever. Other features: UV indicator, flow indicator, waste discharge port. This bio filter is suitable for up to 2500 gallon ponds with normal fish load or 1500 gallon ponds with heavy fish load. The filter is designed with three ports: a water intake, a middle water output, and a waste discharge output. There is a dial control on its lid for switching between the water output and the waste discharge output. The transparent intake is fitted with a flow indicator (a small orange propeller) that can rotate thanks to the water flow. The rotation speed of the propeller helps you estimate the amount of dirt and debris accumulating inside the filter canister, which slows down the water flow through it. By this way, it helps you know when you need to clean the filter so that it can work properly. The waste discharge port is designed for you to easily clean the filter without the need of disassembling anything. 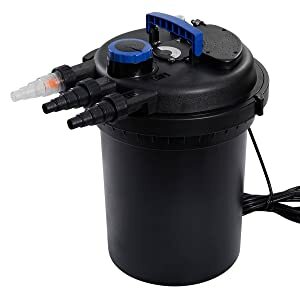 Only rotate the dial control to open the waste discharge port, the filter will make a reversed water flow inside its canister that loosens the dirt and debris attaching on the filter media and removes them. The filter features a 13W UV sterilizer that helps to kill harmful microorganisms and algae spores in the water. By this way, it protects the livestock in your pond from harmful parasites. There is also a UV lamp indicator located on this filter which keeps the track of when the UV sterilizer is functioning. It also comes with Bio-balls for biological filtration. 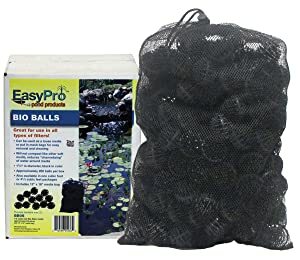 The Bio-balls are made out of a plastic material and are specially designed to help this filter do a better job at filtering the pond water. These Bio-balls are specially manufactured to provide a large and ideal surface for encouraging the colonization of beneficial bacteria. These bacteria help process harmful ammonia and nitrite and make the water safe for livestock. The Bio-balls are made of durable materials so they won’t degrade easily and are able to work effectively for a very long period without the need of replacement. These helpful filter media can also help to prevent the filter from clogging up. This product is also designed for easy setup. It comes with spiral stepped hose adapters for easily using with various hose sizes. It comes with a 15 ft. power cord which you can use to plug this filter into an electrical outlet. It is intended to work outside of the koi pond and ideal to use in normal pond water. Please note that you need to buy a separate water pump to work with filter. A TetraPond 1900 GPH water pump will perfectly fit it. Other features: back flush port for easy cleaning. Other sizes: for ponds up to 2500/4000 gallons (18W UV). This bio-active pressure filter has many helpful features built into it. It contains an integrated 9W UV clarifier which will help to control the algae in your garden koi pond and prevent it from spreading and growing rapidly. The UV clarifier will also work to remove harmful parasites in the water. The filter uses bio-activators to perform both mechanical and biological filtration to purify the pond water. These filter media are able to remove both dirt and harmful nitrogenous toxins (ammonia and nitrite) out of the water. It also works to create a healthy nitrogen cycle for your koi pond. The fundamental of this bio filter is very easy to understand. It works together with a pond water pump (buy externally). The pump will first pump water into the filter which contains a huge amount of bio-activators for filtration. The water then goes through the UV sterilizer for killing free floating algae spores and harmful microorganisms. Afterwards, the filter will then put the filtered water back into the pond. This process constantly repeats itself so you can rest assured that your koi pond water is clean. 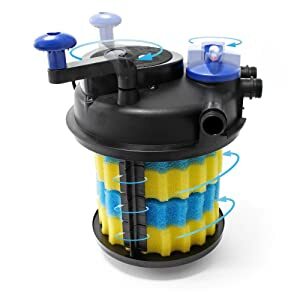 To help make cleaning the filter easier without opening the lid, this filter also features a back flush port on the back of it. 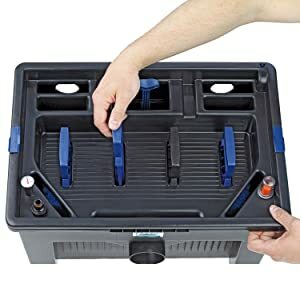 When you need to clean the filter, only rotate the dial control on its lid to open the back flush port as well as close the normal water output. When the back flush mode is activated, it creates a back flush water flow inside the canister that helps to loosen the dirt and debris trapped in the bio-activators for removing follow the water flow. The bio-activators are manufactured for perfectly support this process for easier cleaning and maintenance. The filter is made with heavy-duty materials. This will ensure that it will work for a long time and withstand constant use. The filter can work with up to 1500 gallon ponds, but there are also larger TetraPond models which can work with up to 2500 and 4000 gallons. Other sizes: OASE BioSmart 10000. This koi pond filter is ideal to use in koi ponds that contain up to 5000 gallons of water. 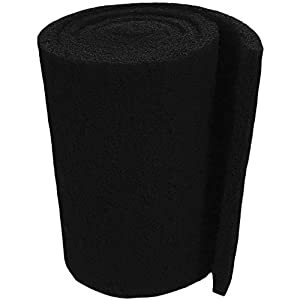 Its filtration system includes four large foam pads attached to handles for convenient cleaning. Whereby this design, the filter is very easy to maintain. 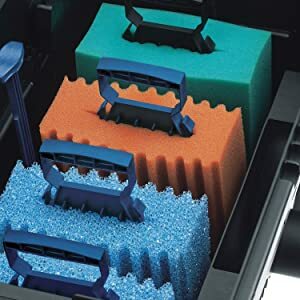 Only open the top of the canister and pull the handle on each foam several times to squeeze the sludge and debris out of the foams into the bottom of the filter. The sludge and debris can be removed out of the filter afterwards thanks to its sludge drain. Besides these helpful features, the filter is also fitted with a cleaning indicator notifying you when the foam pads need to be cleaned and a temperature gauge helping you to keep track of the current water temperature. 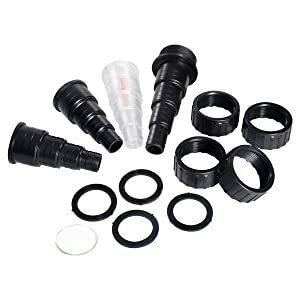 The package also comes with hose adapters, gaskets, hose clamps, and retaining rings for easy tubing without worry about water leaks. Other features: waste discharge, rotating handle for thorough cleaning. The filter can move water effortlessly up to water structures like waterfalls in your koi pond without problems. It is best used for fish ponds up to 900 gallons with koi and other fish or decorative ponds up to 1600 gallons without fish. Its filter chamber is heavy-duty, so it can be used with a heavy water flow of up to 1600 GPH from a pond pump. Please note that the product doesn’t come with a pump, so you have to buy one to operate it. Inside this filter you’ll find a special filtration system with foam pads. The foams are specially structured for easy cleaning and better sludge removal thanks to the cleaning handle located on the top of it. You can rotate the cleaning handle to help clean the interior of the filter canister thoroughly. The filter also features a reversed water flow function for waste discharge as well. Overall, this system is beneficial in the sense that it will prevent you from having to clean the filter quite a bit. Also included in this product is a 13-watt UV clarifier. 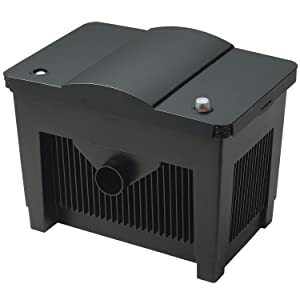 This clarifier will use UV radiation to help destroy any algae spores and harmful parasites in your koi pond and prevent them from spreading. This UV radiation is extremely powerful which helps to instantly kill the algae which can prevent you from having to constantly clean the pond. This model comes with inlet and outlet hose adapters which you can use to attach a wide variety of hoses to. Other features: backwash cleaning, cleaning indicator. This pressurized pond filter can work in a pond that contains up to 2100 gallons of water. The filter will work with a pump to remove water from the pond to clean it and then send it back into the pond once it is cleaned. The filter uses mechanical and biological filtration to help remove dirty particles and harmful compounds from your koi pond water. The mechanical filtration is performed by special foams that work to quickly filter dirt and other debris from the water. The biological filtration uses lava rock media. These small materials look like pebbles; however, they are able to provide a large porous surface area for the colonization of beneficial bacteria. The filter also features a backwash system for easy cleaning. This system works to clean itself to prevent you from having to do that work by your hands. There is also an easy-view cleaning indicator on the lid to notify you when you need to perform backwash cleaning. 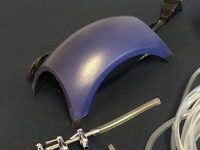 The product comes with click-fit connectors for easy and flexible setup with ¾-inch, 1-inch and 1 ¼-inch hosing. This model can be installed either above or below ground.